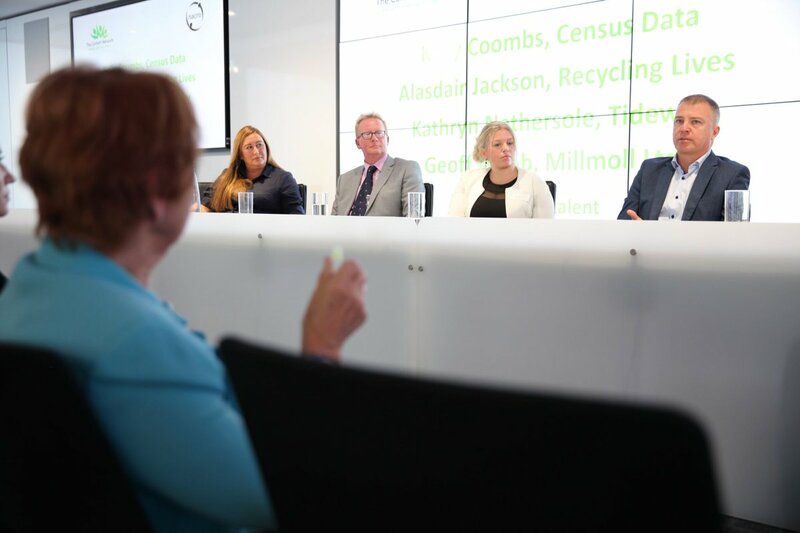 On Friday the 21st of September The Corbett Network hosted their 'Tapping into New Talent" event, in partnership with Nacro. The day was aimed at encouraging businesses to start employing those with criminal records, and provided a wealth of information to help them take those first steps in to doing so. We will highlight two great examples of both new initiatives and information sources that were showcased. One of the key issues faced by the criminal justice system is how to improve the levels of engagement between prisons and employers. Ian Bickers, the Ministry of Justices' Head of Education and Employment Strategy, stated that there are currently 8,500 prisoners in vocational training, 11,000 engaged with prison industries, and 13,000 in work activities, such as cleaning and cooking, daily. Despite this high level of activity, very little translates into employment upon release. To tackle this issue the Ministry of Justice is launching The New Futures Network. The New Futures Network will employ a number of employment brokers through out the country that will build and manage employer relationships for prisons through out England and Wales. By acting as an employer hub for a number of prisons, each of these employment brokers will be able to gain a deep understanding of both the regional and national opportunities and funnel them to the most suitable establishments. They will be a vital information source for both businesses and employers so that the great number of people that have gained qualifications and work experience in prison can utilise this to find gainful employment in the community. This exciting innovation will launch in spring 2019. 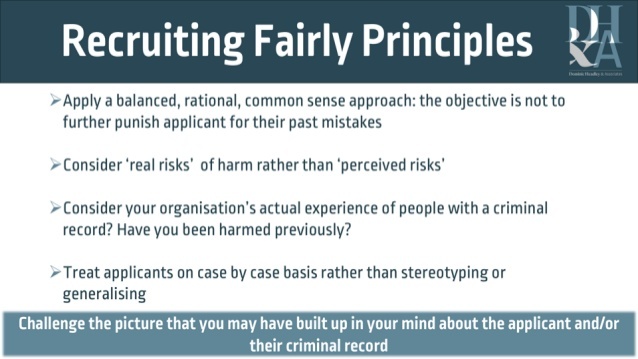 For those employers that have taken the first steps towards employing people with convictions there is often confusion about how they should manage the process of Disclosure and Barring Service Checks. Dominic Headley, of Dominic Headley & Associates, gave a legal briefing which covered the intricacies of the process, and detailed what level of check employers should be using dependent on the industries they are operating within, or where the role that the applicant is applying for will be working. Most importantly, he laid out a better way forward for businesses if they are to find the great talent that is often excluded from the workforce. 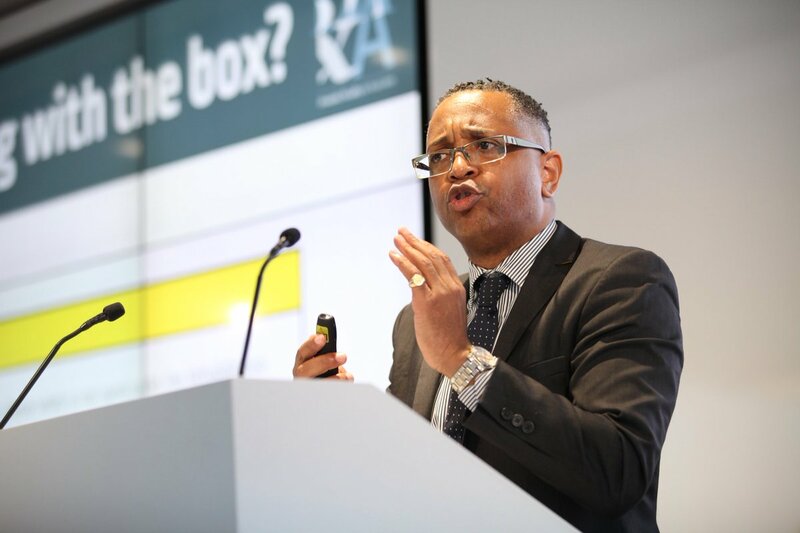 Giving examples of how to manage the process so that an employer can implement a safe, but fair, recruitment process, Dominic outlined why the 'Ban the Box' campaign is a great step towards a more effective recruitment strategy for businesses, displaying that it allows applicants to be considered on their skills, experience, ability, and not simply their past mistakes. Dominic suggested procedures such as considering the relevancy of the offence, the length of time since it occurred, and the efforts made to address issues that may have led to the offence occurring, when assessing the importance of someone's criminal record. Ultimately, stating that the business must challenge the picture that they may have built in their mind about the applicant, and treat applicants on a case-by-case basis if they don't want to miss out on the great opportunity that these candidates represent. (We will be posting a detailed blog featuring Dominic Headley outlining the best recruitment practices for businesses in the coming weeks).